Brushing is Fun with FireFly Ready Go Brush & ToothFoam #Firefly4Kids - It's Gravy, Baby! I’ve mentioned before that one of my least favorite tasks is brushing Bryson & Bella’s teeth. If Justin is home, he usually takes over teeth-brushing time. Bryson and Bella like brushing their teeth, but they want to do it independently and I know that they will miss half of their teeth if we let them do it alone. It’s a struggle to keep them interested, because even though they like it, they get bored rather quickly and then they are ready to move on. The thought of a timer has crossed my mind more than once, but I’ve never implemented it as part of our routine. We were given the opportunity to check out some new kids oral products from FireFly and I was so excited to see that they have a built in timer. So cool! I thought it was just my kids that loved traffic lights, but since checking out the new Firefly Ready Go Brush products, I realize that almost all kids like those red, yellow, and green lights. When I showed Bryson his new FireFly toothbrush, he was ready to go brush his teeth immediately. Instantly, he put it together that the toothbrush was like a traffic light. Of course, Bella follows him around so she had to check it out too. They were both in awe and insisted on brushing their teeth over and over again. Those little lights are mesmerizing to kids and if that’s what it takes for the to really get into brushing their teeth, so be it! Dentists recommend that children brush their teeth for 60 seconds per row. The light-up timer is activated by an easy to press button. The FireFly Ready Go Brush features the colors and mimics the cycle of a traditional traffic light. For the first 30 seconds, the light flashes green for “go.” Then, the light changes to yellow to signal that brushing is halfway over. When the red light comes on, the user can stop brushing. The cycle is then repeated for the second row of teeth. Another great feature of the FireFly Ready Go Brush toothbrush is the suction cup at the bottom. It holds it upright like a traffic light and helps keep the bristles dry, clean, and out of the sink. In our oral care package, we also received the new FireFly Fluoride Foam Toothpaste, which is different from any other toothpaste we’ve used before. Unlike other toothpastes, you can spray the light foam directly into your child’s mouth. My kids do not like most toothpastes. As soon as we begin brushing, they are ready to spit. I admit that I was worried about putting toothpaste directly into their mouths, but they surprised me. Not only did they not hate it, they actually like the FireFly Fluoride Foam Toothpaste. It has a whipped cream-like texture and a yummy bubblegum flavor and my kids would literally eat it if I let them. If you have a child that hates toothpaste, you seriously need to try this foam. Of course, you can’t have fantastic kids oral products without some fun characters. Both new FireFly products are available in Original, Angry Birds, Spiderman, Barbie, and FireFly. For ages 3 – 12, you can find FireFly Foam Toothpaste ($2.99) at Walgreens, Target, Amazon.com, and Drugstore.com and the FireFly Ready Go Brush ($3.99) at Target, Kroger, Meijer stores, Amazon.com, and Drugstore.com. Keep up with the latest FireFly products by “liking” the FireFly Facebook page and checking out www.FireflyFunBrushing.com. I have partnered with FireFly to bring you this post. All thoughts & opinions remain my own, as always. Who knew brushing could be so fun?! 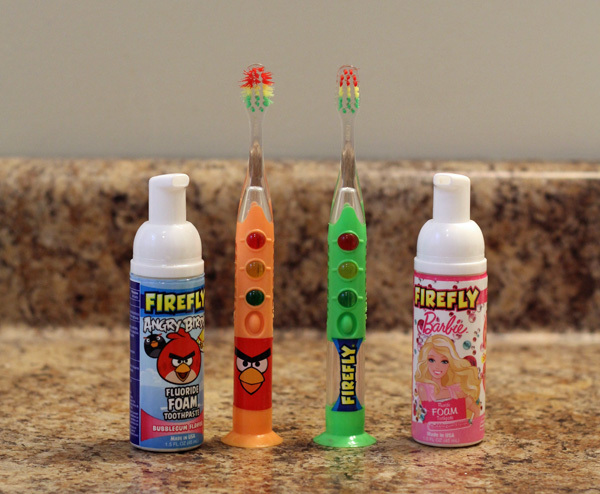 My kids have used FireFly toothbrushes before and really like them. I didn’t know they made toothpaste too. Pretty cool! Tooth brushing is always a challenge. It is part of the evening routine I dread too. I love to see that products like this are making it more fun for kids to learn the habits of how long to brush! My grandson never wants to brush his teeth. He might do so much better with a cool, new toothbrush like this!